Burberry Touch For Men displays an initial freshness of hard-to-define notes: tender violets and tart mandarin blend subtly with invigorating waves of white pepper, softened by the smoothness of Virginia wood and oak moss. Like a strong, deep breath, the trail develops quietly into a sturdy, masculine alchemy of vetiver, white musk and tonka bean. I get compliments weekly. especially from women on the fresh scent, Burberry Touch. I have been using both Burberry Touch and Brit for many many years, I get compliments all the time, I love them both. I've been wearing this for years. It is one of the few fragrances I can wear in the summer -- it is not too heavy. I was attracted by the scent from an older man at [@]. I fell in love with it! 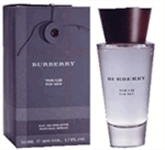 He told me it was Burberry Touch by Burberry so I have bought it for all the men in my family! Yea!! !